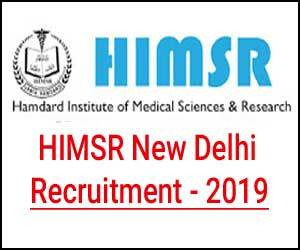 New Delhi: The Hamdard Institute of Medical Science and Research (HIMSR), New Delhi has released a notification for 18 Vacancies for Professor, Associate Professor and Assistant Professor. The Selection will be Based either Written Exam/Interview. Last Date to Apply: 28-01-2019. The vacancies are in the Department of Dermatology, Paediatric, General Surgery, Radio-Diagnosis, Anaesthesia, Psychiatry, T.B. & Chest, Paediatric, General Surgery, Medical Oncology, Endocrinology, Gastroenterology, Neurology, Cardiology, General Medicine, Anaesthesia, Paediatric. Qualification for Professor, Associate Professor and Assistant Professor: As per under Govt. rules. Age for Professor, Associate Professor and Assistant Professor: As per under Govt. rules. Remuneration for Professor: Rs. 2,30,000/- Per Month. Remuneration for Associate Professor: Rs. 2,50,000/- Per Month. Remuneration for Assistant Professor: Rs. 1,10,000 – Rs. 1,20,000/- Per Month. 1. Candidates called for interview will have to come to the place of interview at their own expenses and bring with them their original research papers, degree and experience certificate etc. for verification. Applications complete in all respects should reach to the office of the Dean, HIMSR, New Delhi – 110062 latest by 28th January, 2019 along with the following: Bio-data (highlighting personal details, academic records, teaching and research experience).Demand Draft of Rs. 500/- in favour of ‘Hamdard Institute of Medical Sciences and Research’, payable at New Delhi. 2. Attested copies of certificates & testimonials in support of qualification and experience. Incomplete applications and those received after the closing date will not be entertained. Appointment is on contractual basis with provision for two year probation period. Desirable Experience for (I to M) positions: Minimum one year experience in concerned specialty from MCI recognized teaching institution. Application Fee: Demand Draft of Rs. 500/- in favour of Hamdard Institute of Medical Sciences and Research, payable at New Delhi. Address: Office of the Dean, Hamdard Institute of Medical Sciences and Research, New Delhi – 110062. 1. The Institute reserves the right not to fill up the vacancies if the circumstances so warrant and to call only short-listed candidates for test/ interview. 2. The Institute reserves the right to consider name of suitable candidates who may not have applied and also to relax the qualification and experience for deserving candidates, as approved by the Selection Committee. 3. Candidates called for interview will have to come to the place of interview at their own expenses and bring with them their original research papers, degree and experience certificate etc. for verification. • Bio-data (highlighting personal details, academic records, teaching and research experience). • Demand Draft of Rs. 500/- in favour of ‘Hamdard Institute of Medical Sciences and Research’, payable at New Delhi. • Attested copies of certificates & testimonials in support of qualification and experience. 5. Incomplete applications and those received after the closing date will not be entertained. 6. Appointment is on contractual basis with provision for two year probation period. How come the salary of Associate Professor is more than that of the Professor.